Playtech has punched back with this 40 pay line fantasy slot with ice, heroes and free spins in abundance. The Raiders of the Hidden Realm slot is Playtech’s response to other developers and a wave of new slot releases. Playable from 40p a spin on mobile, tablet and desktop, this game is a serious contender with its raiders shuffle and multiple free spins games that include multipliers. The year is 2018, it’s another Friday and I’m desperate to find a new slot worth reviewing. I’m thinking NetEnt, NextGen but not Playtech. Why not Playtech? It’s on the other side, Playtech is all about Playtech. But you should never overlook their games and here’s why. This one’s a beauty. Be it cold, calculated and risky. Welcome to an ice kingdom of possible fortune! You can’t get more premium than the Raiders of the Hidden Realm slot. There’s no messing around here. This one’s for the high rollers and big spenders. In fact I’d bet that Playtech built this for high rolling players! It makes me wonder. Who is playing online slots these days for £500 a spin? But clearly some people are, and this is the game to do it. That’s the first pull of this casino game. It’s not just about the big bets with betting variables that include everyone and spins from just 40p.For that you get a mysterious iced over world and the potential rewards of its hidden realm, a mystery worth paying for? 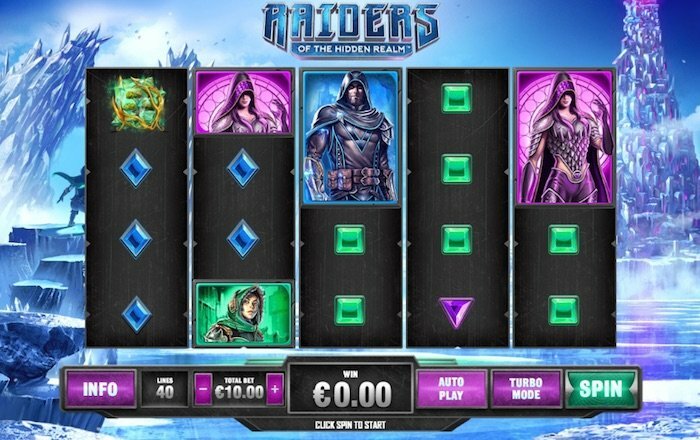 The Raiders of the Hidden Realm slot is a 5 reel, 40 pay line fantasy themed casino game from Playtech. 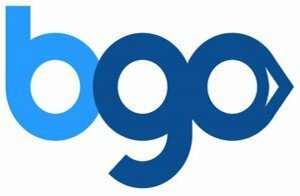 You can play a total of 40 coins from £0.01 to £12.50 per bet making spins of 40p right up to £500 (as already eluded). The animation, graphics and gameplay is some of Playtech’s best work as they attempt to showcase one of the best new slots of the year. And trust me; this slot will leave its mark before the Christmas decorations go up again. 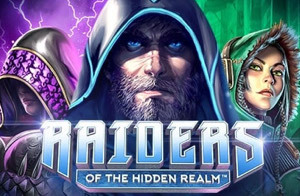 With dynamic software and highly responsive code, the Raiders of the Hidden Realm mobile slot is the ‘on the go’ variant of a highly capable online desktop version. HTML5 makes this possible and it looks good anywhere no matter your screen size of choice. The jackpot for the slot is 500 x coins and the payout rate is 96.28%. In terms of variance, it’s a medium to high variance video slot. The fantasy slot follows characters Morgana, Strider and Sparks and weaves winning features around each of them, notably extra high-value symbols, sticky wilds and multipliers. Along with the 3 x free spin bonuses, there’s a punchy shuffle reminiscent of old fruit machines and standard wilds that improve the payout capacity. In short, it can pay well but the stakes are high. How much can you win playing Raiders of the Hidden Realm? If you’re playing Raiders of the Hidden Realm slot for real money, there are a number of prizes you can win. Looking at the games pay table, we can work out how much you can win for the lowest and maximum bet values. That’s 40p and £500 a spin respectively. At 40p a spin, or £0.01 a coin, you could win 5p for 3 x green crystal symbols, 75p for 4 x purple crystal ball symbols or £1.50 for 5 x wild symbols. The Raiders of the Hidden Realm jackpot of 500 x coins would pay out £5.00. High rolling at £500 a spin or £12.50 a coin would return the following payouts: a lowest win of £62.50 for 3 x pink crystal symbols, £1250.00 for 4 x Sparks symbols or £3125.00 for 4 x wild symbols. The jackpot playing at this level would pay £6250. It’s basically 12.5 times your spin cost. The numbers on offer are intriguing when you consider 40 pay lines of probable prizes leading to multiple value counts. The game also includes multiplier wilds of 5 x that would make a £10.00 win £50.00 while the Sparks free spins game offers up to 25 x in multipliers. In theory, that’s a maximum win of 12.5 your stake multiplied by 25. This coupled with wilds in play suggest the slot has a very strong pay table. Like other new slot games, it’s the features that matter when it comes to winning the bigger prizes. Playtech cleverly uses the characters of the game with Raiders Morgana, Strider and Sparks assisting with the action. The Raiders of the Hidden Realm slot includes 3 x free spins rounds with different capabilities, the standard wild and a base-game shuffle. Unusually, Raiders of the Hidden Realm doesn’t have scatters and instead uses the characters to start their respective free spin games. There are 3 x free spin games in total and each one has a different feature. In order to activate the free spin games, you’ll need to get a full stack of the character on reels 1 and 5. Morgana is the raider in the hood with the purple hair. She’ll get you 8 free spins and during those spins you’ll see plentiful amounts of Morgana symbols. This is good because it means that those extra high-paying symbols can help boost the total prize money. Worth noting as 5 x Morgana symbols offer the jackpot! Strider is the raider in blue with the beard and our resident tough guy. He’ll get you 7 free spins and during those spins you’ll find wilds that in fact become sticky wilds, remaining in place for the remainder of the bonus. This is good because sticky wilds can be highly lucrative in assembling winning lines for payouts. Sparks is the green earthly warrior and she’s combat ready. By that I mean ready to multiply the crap out of prize money held in this bonus. She’ll get you 6 free spins and during those spins any new Sparks’s symbols that appear will award random multipliers. This is good because everyone likes multipliers. That and the fact you can get up to a 25 x multiplier on a winning streak. You get less spins with this one, but it’s probably the most effective. Unlike the free spins that take place above the base game, the Raiders Shuffle happens in the base game. It’s a nice touch because if you don’t quite make the free spins with a full trigger, you’ll hit this one. Basically you need a full stacked character on reel 1 and a partially stacked matching symbol on reel 5. What happens next is quite cool, all of the symbols split, shuffle and then turn into wilds wherever they land. This is a nice addition from Playtech and something you’re more used to seeing in a fruit machine. Additional wins? Highly likely! If you’re looking to raid the hidden realm for yourself, this is one of Playtech’s best games to date. It’s premium yes, but don’t let the price tag put you off. That 40p spin might be worth the adventure. It’s an epic gamble with plenty on offer, not just one, but three different free spin games. The raiders shuffle will help players who fall short of the main events while the gameplay in general will keep everyone interested. The Raiders of the Hidden Realm slot looks, sounds and spins on a scale we’ve all been waiting for. Welcome to the next level.